The year 2015 is shaping up to be the warmest year on record. In the media, a lot of attention has been given to the many floods, droughts, wildfires and heatwaves that have battered the world this year. Sadly, though, little attention is given to the situation in the Arctic. The image on the right shows a forecast for December 30, 2015, with temperatures at the North Pole above freezing point, as further illustrated by the nullschool.net image below, showing a temperature forecast of 1.1°C or 34.1°F for the North Pole. Wind speed at the North Pole is forecast to be 105 mph or 168 km/h on December 30, 2015, and 133 mph or 215 km/h closer to Svalbard. 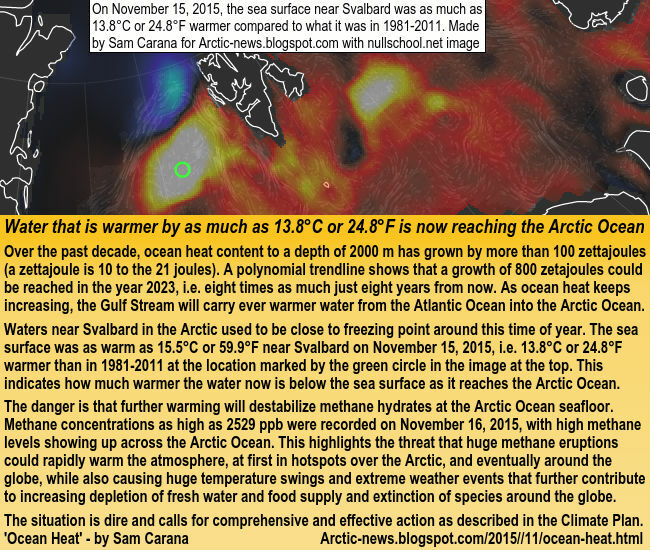 As the image below illustrates, very high temperatures are forecast to hit the Arctic Ocean on December 30, 2015. 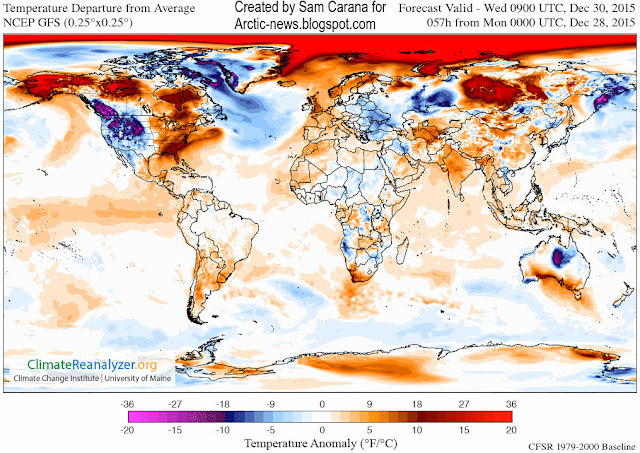 Above image shows temperature anomalies at the highest end of the scale for most of the Arctic Ocean, with a temperature anomaly for the Arctic as a whole of 2.4°C or 4.32°F above what was common in 1979-2000. The situation isn't likely to improve soon. For January 3, 2016, the temperature in the Arctic is forecast to be as much as 4.56°C or 8.21°F warmer. How is it possible for such high temperatures to occur over the Arctic Ocean? 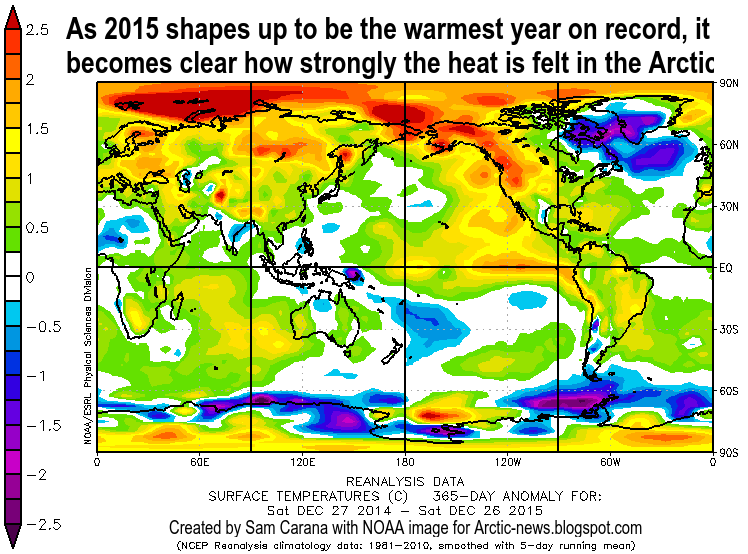 The image below shows how the year 2015 is shaping up in terms of temperature anomalies. Global warming is felt most strongly in the Arctic as warming continues, as illustrated by above image and by the image on the right. Warming in the Arctic is accelerating due to feedbacks. One of these feedbacks is the way the jet streams are changing. Changes in the jet streams are becoming more prominent as the Arctic is warming up more rapidly than the rest of the world. As the difference in temperature between the Arctic and the equator becomes smaller, the speed at which the jet stream circumnavigates the globe is decreasing and jet streams become more wavy. Meanwhile, most of the extra heat caused by global warming goes into the oceans, and the Atlantic Ocean is warming up fast. At the same time, meltwater is accumulating at the surface of the North Atlantic, lowering sea surface temperatures there. With such large differences between high temperatures over North America and lower temperatures over the North Atlantic, the speed of the jet stream between those places can increase dramatically. 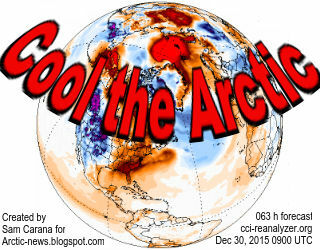 The result is that huge amounts of warm air are being pushed high into the Arctic. 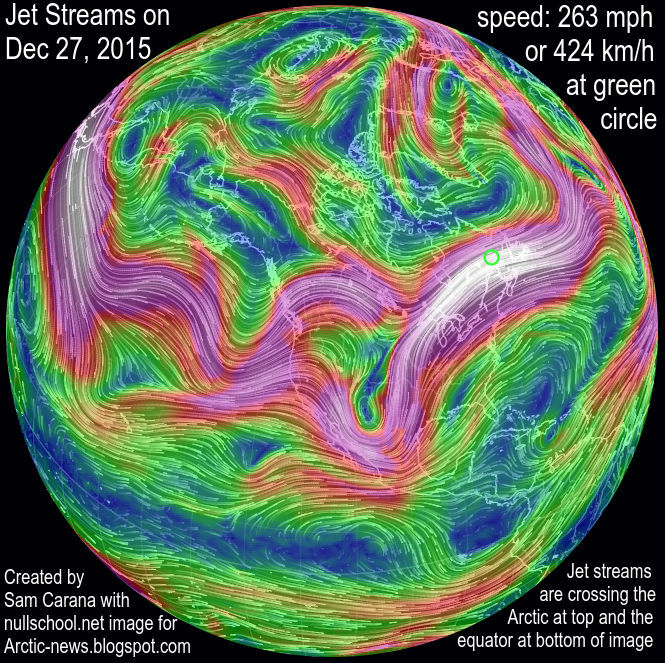 The image on the right shows the jet streams on December 27, 2015, when speeds as high as 263 mph or 424 km/h were reached at the location marked by the green circle. Also note the jet streams crossing the Arctic at the top of the image, while crossing the equator at the bottom of the image. The image below shows sea surface temperature anomalies on the Northern Hemisphere in November. For over a month now, storms over the North Atlantic have been pushing hot air high up into the Arctic. The video below uses surface wind content by Climate Reanalyzer (selected daily averages and sequences of forecasts) to cover the period from December 5, 2015, to January 8, 2016. Above video stops at January 8, 2016, when two cyclones are visible, one in the North Atlantic and another one over the North Pacific, prompting me to create the image on the right. What causes these storms to grow this strong? Waters keeps warming up dramatically off the east coast of North America. Emissions from North America tend to extend over these waters, due to the Coriolis effect, and this contributes to their extreme warming. The image below shows carbon dioxide levels as high as 511 ppm over New York on November 5, 2015, and as high as 500 ppm over the water off the coast of coast of New Jersey on November 2, 2015. 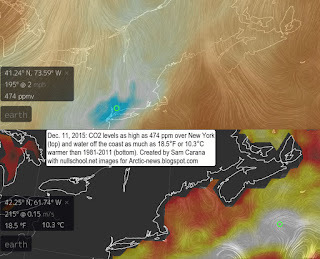 The top panel of the image on the right shows that on December 11, 2015, carbon dioxide levels were as high as 474 ppm (parts per million, surface concentration) at the location marked by the green circle in New York. The bottom panel of the image on the right shows that the water off the coast was warmer by as much as 10.3°C or 18.5°F at the location marked by the green circle on December 11, 2015. The NASA video below shows carbon dioxide emissions over the year 2006. It's not just CO2 off the North American coast that contributes to further warming of the Gulf Stream, many other emissions do so, including methane, CO, etc. Carbon monoxide (CO) is not a greenhouse gas, but it depletes hydroxyl, thus preventing oxidation of methane, a very potent greenhouse gas. The animation below shows a carbon monoxide level at green circle of 528 ppb on December 28, 2015, 0900z, while the sea surface temperature anomaly there was 15.8°F or 8.8°C on that day. Carbon monoxide reached much higher levels recently over land, as illustrated by the image below that shows a CO level of 2077 ppb in New York on January 6, 2016. 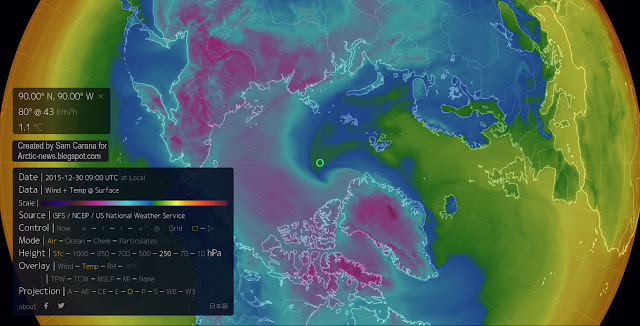 The image on the right shows that it was warmer by as much as 9.6°C or 17.2°F near Svalbard on December 25, 2015, at the location marked by the green circle. 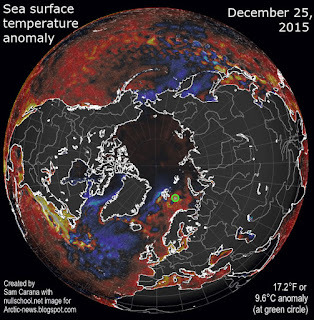 The same anomalies were recorded on December 26, 2015, when the temperature of the water there was 11°C or 51.9 °F. 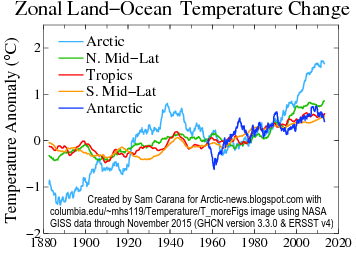 This gives an indication of how warm the water is that is being pushed underneath the sea surface into the Arctic Ocean. Strong winds and high waves can cause more sea ice to be pushed along the edges of Greenland out of the Arctic Ocean, into the Atlantic ocean, expanding the cold freshwater lid on the North Atlantic, in a self-reinforcing feedback loop. 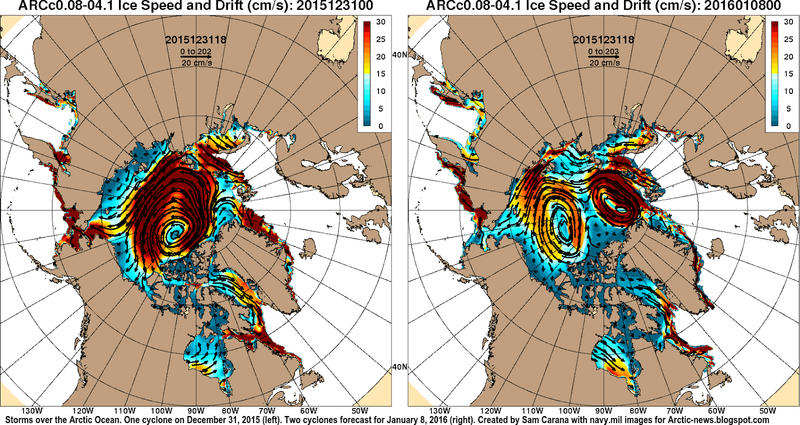 The image below shows the impact of these storms on sea ice speed and drift on December 31, 2015 (left) and a forecast for January 8, 2016 (right). The danger is that, as warmer water reaches the seafloor of the Arctic Ocean, it will increasingly destabilize sediments that can contain huge amounts of methane in the form of free gas and hydrates. 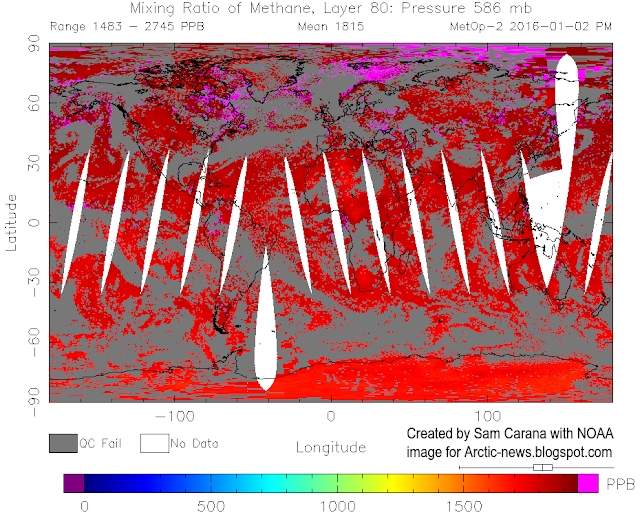 Methane levels over the Arctic Ocean are already very high. Above image shows methane levels as high as 2745 ppb over the Arctic Ocean on January 2, 2016. 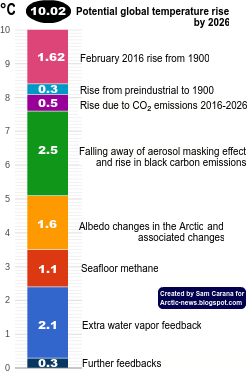 High releases from the Arctic Ocean seafloor are pushing up methane levels higher in the atmosphere, as discussed in earlier posts such as this one. 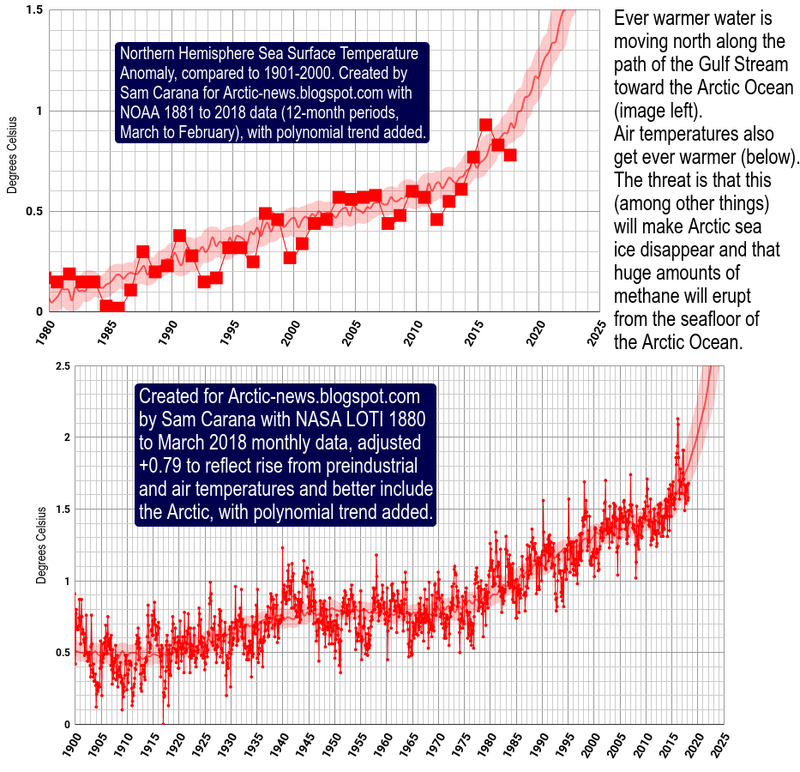 So, while the extreme weather events that have occurred in the year 2015 are frightening, even more terrifying is the way the water of the Arctic Ocean is warming up. Sadly, this is rarely even discussed in the media. So, let's once more add the image below that should have been given more media attention. Sad indeed The near term extinction for humans seems likely. When a world specie corporate hang 2 or hang glider rating ability gains awareness of flying controls it is natural for overindulgence to out do awareness of danger of overindulgence at expense of Earth. So I'm trying to say let's graph 2nd Law System Isolation and rise of Entropy.. The Pecuniary nature of Ring fencing of Earth to death of Biosphere function at Zeroth Law of balance in evolution is basically an obstacle hurtle all life must quantify to overcome at intelligence extinction hurtle in the universe ta quantum snap. Here in NYC, the temps have been as high as 72 degrees and the rain has been pouring down. This week, however, things have been acting more like winter as it's supposed to. The tragedy is that people will see this return to winter as proof that things are back to normal and that there is nothing to worry about. 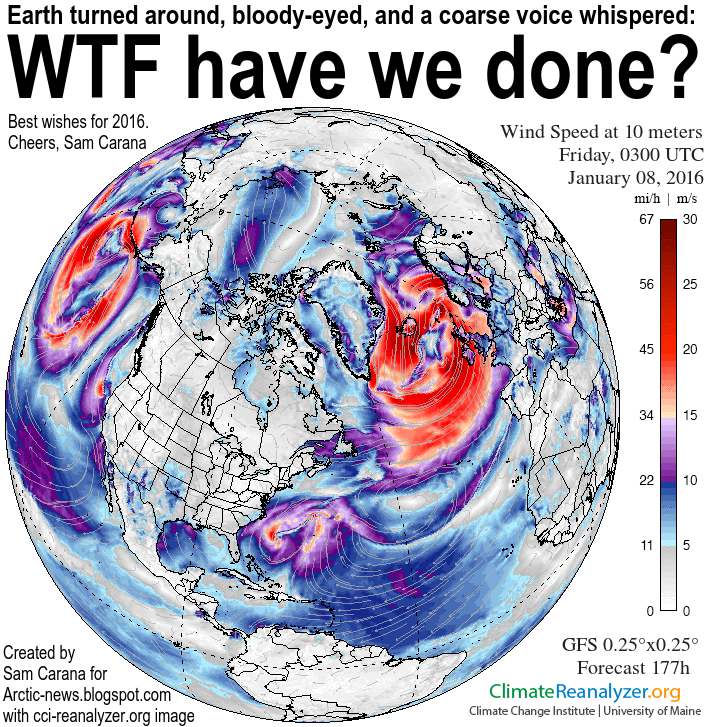 At least in Norway they are reporting about global change! In the US there has been some really frightening weather, but the reports treat them like they are freak accidents and not part of this climate change that is going on. The flood along the Mississippi River has been historic, the news channels have been pretty nonchalant about it here. I wish I had a way to translate the link you gave, but I do have friends in Norway so I can ask them about the article.